and shrimp tacos you shall get! I had a request for these yesterday and decided hubby would love them. I just decided as I was at the store what I would get for a sauce and garnish. They turned out fabulous and hubby was thrilled. I mean REALLY thrilled. In fact he gave them an 11 out of 10. I think he was just kissing up but who cares right? When I stopped at the Asian Market for shrimp, I had to get them with the shells on and not deveined. If you can, get your fish monger to do it for you. If not, get them home, get those shells off, make a slit down his back, and rinse out the icky black digestive thingy. I am not discussing it further. I am sure you can find tutorials on YouTube if you have never done it. This took me forever. I am such a spoiled brat, I just want to buy them already done. When I got home and made these, I was in to much of a hurry to clean as I went. Have you ever done that? Just ignore the mass of dirty dishes you are creating and just keep working? When you finish, you stop and look at your kitchen and think it is possible you just had an out of body experience because there is NO way YOU did all that. Once the realization sets in, you convince yourself to finally start cleaning up. After a few dishes, you decide to sit down a second because you need to regain some energy before you finish. You never finish. At least not THIS night. Yea, I was there. I did it. It completely sucked. Anyway if we are gonna get these made we need to get movin'. Sprinkle 2 tbsp of old bay seasoning over your shrimp. In a nonstick skillet add in peanut oil and let it heat up. Add shrimp. Saute until the shrimp are pink on one side. At this time add 1/2 cup sweet chili sauce and garlic. Saute shrimp until the are done or when they are pink on both sides and for a letter "C". If you let them go to long they become close and make a "O" shape. They are overcooked at that point usually. They will still taste great they will just be a bit tougher and not tender. Here is an example. And for the record I overcooked a few of mine while taking this photo! Heat up shells over a flame or in the oven. Serve the shrimp in the shell on a bed of bok choy and topped with onions, peppers and tomatoes. Spoon some of the juice over as well! These are so easy, but incredibly delicious. I think it would work just as well with chicken or pork! Refreshing and a little kick, excellent with a cold beer! P.S. 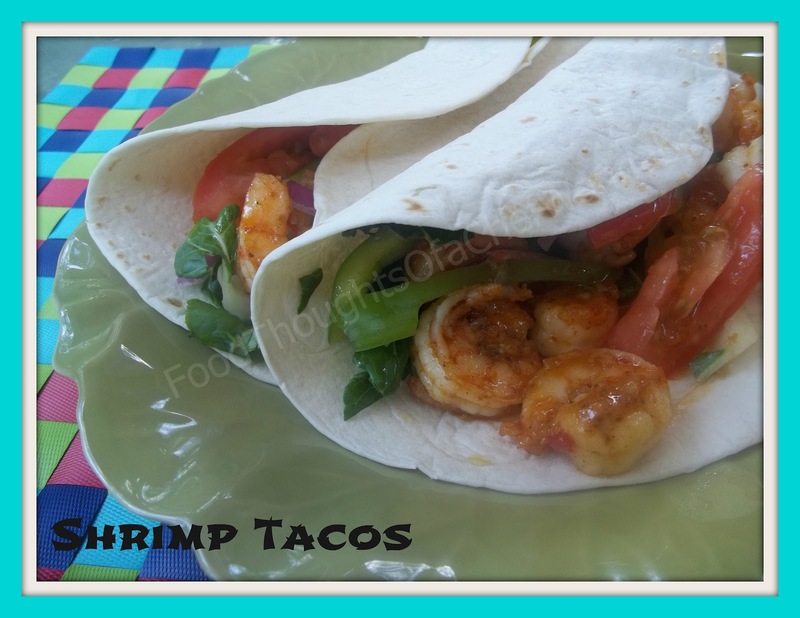 You may get more tacos out of 1lb of shrimp. I hate skimping, so I got 4!